We had a great day today at the New York Camp. 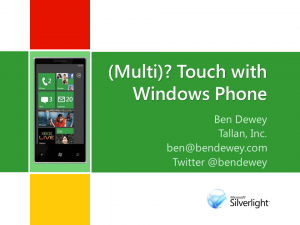 My Handling MultiTouch on Windows Phone 7 presentation was first thing in the morning. Thank you to everyone for coming out early and listening to me talk. My slides and Windows Phone demo application are available for download using the links below. There were a number of resources discussed in our meeting and for convenience you can see find them here.